With the aid of years of understanding of this domain, we provide the first class quality of AutomaticJam Filling Machine. Their optimum performance and minimum maintenance, make these products highly demanded. Semi automatic single head piston filler. Complete machine in Stainless Steel construction. It can fill paste with particles too. Jacketed Hopper to heat product up to 120 deg celsius. Geared stirrer for homogeneous mixing of product. Bonfiglioli/Bonvario make motor only used. Position Indicator for volume adjustment. Festo/Pneumax Make pneumatics only used. Foot switch as well as timer based automatic operation. Select make timer. SS PU wheels available optional. 40 liters capacity hopper in SS316. Filling capacity ranging 2 ml upto 2000 ml available. Shut Off nozzle provided for drip proof result. Tray for placing container provided. Main ON/OFF to start and stop the machine. Tc fitting provided for ease of cleaning. Transfer pump provided optional to pour material in hopper continuously. Available in double head model also. Products like Chocolate paste with chocolate chips, toothpaste, flavored syrup, fruit jam, whole fruit squash, pickles, Chana gravy, barbecue sauce, mustard sauce, cheese spread, peanut butter, dosa batter, yogurt, shrikhand, alcoholic drinks, Vitamin drinks, Fruit Juices, Iced , Tea, Edible Oil, Honey, Ghee, ketchup, mayonnaise, flavored milk, chyawanprash, Glue, PVC Solvent, Grease, Floor Cleaner, Paints, Chemicals, Lubricant Oil, glycerin, rose water, pesticides,Nail Polish, Nail polish remover, Shampoo, Hair Oil, Creams, Face wash, shower gel, balm, petroleum jelly, kajal, mascara, lotion, balm, scrub, face mask and many more can be used with this machine. Packaging Details Wooden pack at extra cost. We, Kahan International, are instrumental in Manufacturing a product range which is inclusive of Filling Machine, Capping Machines, Labeling Machine, Sealing Machine, Encapsulation machines and many more. For ensuring streamlined Manufacturing of the Filling Machine, Sealing Machine, Capping Machines and Labeling Machine, we have started and maintained a state-of-the-art infrastructural facility with modern machinery and cutting-edge technology. Available with us in various technical specifications, the offered Filling Machine, Sealing Machine, Capping Machines and Labeling Machine are appreciated for their performance, user-friendly operation and longer functional life. 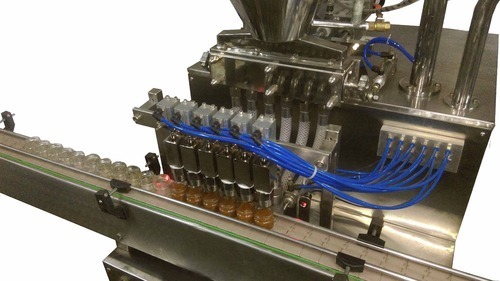 By using wide distribution and delivery network, our logistic support ensure well-timely delivery of these Filling Machine, Sealing Machine, Capping Machines and Labeling Machine. We take bulk assignment of Filling Machine, Sealing Machine, Capping Machines and Labeling Machine, due to our large production capacity and excellent storage capacity.